Extra! Extra! Read all about it! 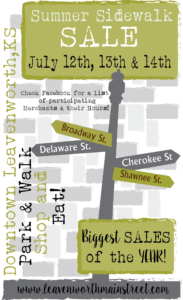 July 12, 13 and 14, 2018 Sidewalk Sales! Three days of extra-ordinary shops, extra-ordinary sales, extra ordinary patrons! Come out and see what treasures you can find!